It was recently reported that a power purchase agreement between National Grid and Cape Wind was approved by the Massachusetts Supreme Judicial Court. National Grid is committed to purchasing half of the output of the project at a starting price of 18.7 cents per kilowatt-hour. This price will then escalate 3.5% per year for 15 years. With this 3.5% annual compounding, the contract price will reach 30.3 cents/kWh in the fifteenth year. Over the term of the agreement, the average price from Cape Wind will be 24.1 cents/kWh. How do these prices for wind generated electricity compare to historical electricity prices in New England? The above graph shows the daily price of electricity in NEPOOL over the period of time spanning 2001 through 2011 (blue line). NEPOOL is New England’s bulk electric power market. In New England, as is the case elsewhere, electricity prices exhibit considerable volatility. Over this eleven year period, daily electricity prices have been as high as 31.2 cents/kWh and as low as 2.5 cents/kWh, and have averaged 6.3 cents per kWh (red line). Electricity prices in New England have been declining. 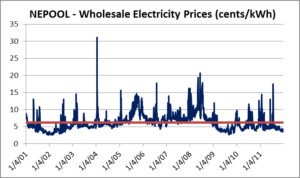 Since the beginning of 2009, daily electricity prices have averaged 5.2 cents/kWh. 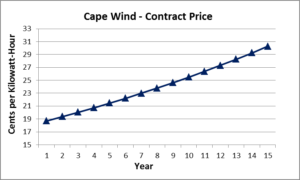 So, how does the cost of electricity from the Cape Wind project compare to historical prices in New England? In order to provide a visual sense, the two graphs above are reproduced below, each modified to have the same vertical axis scale. 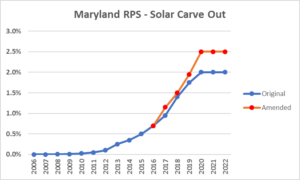 In both cases, the horizontal red line represents the historical average wholesale price of 6.3 cents/kWh. Cape Wind’s website describes their project as consisting of 130 wind turbines that can produce up to 430 megawatts of electricity. 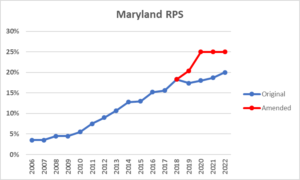 Assuming a 25% capacity factor and the application of both the historical average NEPOOL price and the average Cape Wind contract price to the total projected output of the wind farm, the annual difference in cost is estimated to be $167 million. The Cape Wind project represents a large, long position in what today is expensive electricity with a fixed escalator. This analysis is limited and does not reflect future price movements (up or down) in the cost of electricity associated with the existing and future fleet of generation in New England nor the environmental, social and operational costs and benefits associated with the existing and future fleet of generation and the Cape Wind project.